If that sounds a tad highfalutin, consider this: In September 2011 Jacobs’ family investment firm ponied up $62.5 million to gain control of Express-1, a Michigan-based freight expediter doing $170 million in sales a year. He renamed Express-1 after its XPO stock symbol, moved its headquarters to Connecticut and over four years spent more than $7 billion on 17 acquisitions. Today XPO’s stock trades at $102, giving it a market cap of $12.3 billion, for a compound annual return of 38 percent under Jacobs’ watch. That’s more than double the S&P’s return and better than Amazon’s. Jacobs’ own stake is worth $2 billion, making up the bulk of his fortune, which includes a 50-acre Greenwich estate, a 17,000-square-foot Palm Beach waterfront mansion just down the road from President Trump’s Mar-a-Lago, and a starter modern art collection with works by Picasso, de Kooning, Calder and Lichtenstein. Truth is, corporate roll-ups have a bad rep. Some operators have overpaid, taken on too much debt, touted synergies that didn’t exist or even cooked the books. Yet 14 of 16 analysts covering XPO rate it a buy, persuaded by Jacobs’ dealmaking smarts, his execution and his vision of an integrated logistics company that uses technology to capitalise on the growth of ecommerce and the worldwide supply chain. After Jacobs’ acquisition run, XPO has strong positions in the US and Europe in freight brokerage, last-mile delivery (getting heavy goods like refrigerators from warehouses to consumers), less-than-truckload shipping and contract logistics (handling all of a company’s logistics). Last year it netted $312 million ($2.45 per diluted share) on $15.4 billion in revenues. Free cash flow increased 77 percent to $374 million in 2017, and XPO projects it will top $600 million in 2018. Jacobs has hardly sworn off acquisitions; with XPO’s leverage reduced by half since 2015, he brags about having $8 billion in “dry powder”. But these days he’s talking up organic growth and the $450 million a year XPO is pouring into automation and technology. Of its 95,000 employees, 1,700 are tech professionals, including 100 data quants. “Anything we can automate, we are either automating already or we have on the drawing board to automate,” he says. In addition to pricing algorithms, XPO has developed the Uber-like apps Drive XPO and Ship XPO, which allow truckers to pick up loads and customers to see their cargo move in real time. “Back in the 1990s I wrote reports saying FedEx is a technology company disguised as a transportation company. Today the same could be said about XPO,’’ observes analyst Donald Broughton, who tracks transportation companies at his own St Louis-based firm. For most of his career, Jacobs has been doing deals, moving things and looking to make money from an information edge. His father was a jeweler in Providence, but college dropout Jacobs was drawn to the big profits being made in oil as ­prices spiked in the late 1970s. He read up on oil brokers and then cold-called his way into the business, enlisting the legendary Ludwig Jesselson, head of commodity house Phillip Brothers, as a mentor. (Jesselson’s son is now XPO’s lead independent director.) Eventually Jacobs moved to London (where he met his oil-trader wife, Lamia) and made millions by securing oil from places like Russia and Nigeria and chartering ships to transport it to Europe. By 1989, however, futures markets were squeezing the profits of globe-trotting arbitragers like Jacobs, and he returned to the U.S. to research his next venture. Jacobs settled on waste hauling after reading an analyst’s report describing fat profits at Browning-Ferris. Looking for both talent and inside dope, he interviewed dozens of industry managers. Two former Browning-Ferris execs told him the company had ignored rural areas. Jacobs hired them and went on an acquisition tear, consolidating hundreds of mom-and-pop collectors with overlapping routes in areas like southern Kentucky and Michigan. He took United Waste public in 1992 and sold it in 1997 (to what later became Waste Management) for $2.2 billion, netting $120 million on his original $3 million investment. As that sale closed, Jacobs was working with investment bankers on his next roll-up play: Heavy equipment rentals. He liked it, he says, because it was not only a fragmented market but also a growing one, as firms went from owning to renting equipment like bulldozers, generators and scissor lifts. He invested $35 million and in December 1997 took United Rentals Inc public. By March he raised $285 million, retaining a 42 percent stake. Jacobs traveled the country tearing out Yellow Pages listings to find mom-and-pop rental shops to buy. After hundreds of deals, URI passed Hertz to become the world’s largest equipment renter. But in 2004 the Securities & Exchange Commission began investigating URI’s accounting practices. Two former top execs pleaded guilty to fudging the books from 2000 to 2002 to meet earnings forecasts. Jacobs was never implicated in wrongdoing, and in July 2007 private equity firm Cerberus agreed to buy URI for $4 billion, or $34.50 a share, a 25 percent premium, plus the assumption of $2.6 billion in debt. Jacobs, then URI’s chairman, resigned and went off to run his private investment company. Five months later, as credit markets tightened, Cerberus lost its financing and backed out of the deal. URI’s stock eventually fell below $5; Jacobs himself wanted to take URI private but couldn’t get the money. Yet since his departure from URI, Jacobs’ vision for that roll-up has been vindicated: The stock now trades at $180, for a market cap of $15 billion. It took a bit longer for Jacobs to find his next target industry. In 2011 he began assembling a team of logistics insiders to capitalise on a highly fragmented but growing $3 trillion global market for moving goods. His thesis: Companies don’t want to own their logistics headaches and will happily turn the worry over to an outfit like XPO that offers everything from intermodal and full-truckload shipping to partial-load shipping, distribution warehouses and deliveries of heavy goods to a consumer’s door. Jacobs purposely started out in a capital-light niche of the market. Freight brokers like Express-1 don’t own trucks; they’re middlemen connecting shippers with truckers. But that was only a beachhead for staging acquisitions. After lining up more financing, Jacobs snapped up 3PD, which gave him a presence in home deliveries and installations; intermodal shipping outfit Pacer; and contract logistics leader New Breed, which has such blue-chip customers as Disney, Boeing and Verizon. A big push now is cross-selling between units. Jacobs says 94 of XPO’s 100 top customers buy multiple lines of service from it, up from 86 a year ago. As for his controversial 2015 decision to spend $3 billion for Con-way, Jacobs makes no apologies. He coveted its Menlo Logistics unit in Silicon Valley and considered Con-way’s fleet of trucks insurance against a capacity crunch—indeed, as the economy heats up, a truck shortage and surging freight costs benefit XPO. Today it owns 16,000 tractors, 39,000 trailers and 10,000 53-foot intermodal boxes, plus it has 11,000 trucks under contract and another million trucks available for brokered shipments. It has 775 contract logistics ware­houses, with 170 million square feet of space, and big plans for opening more hubs in North America and Europe for those last-mile deliveries to consumers. 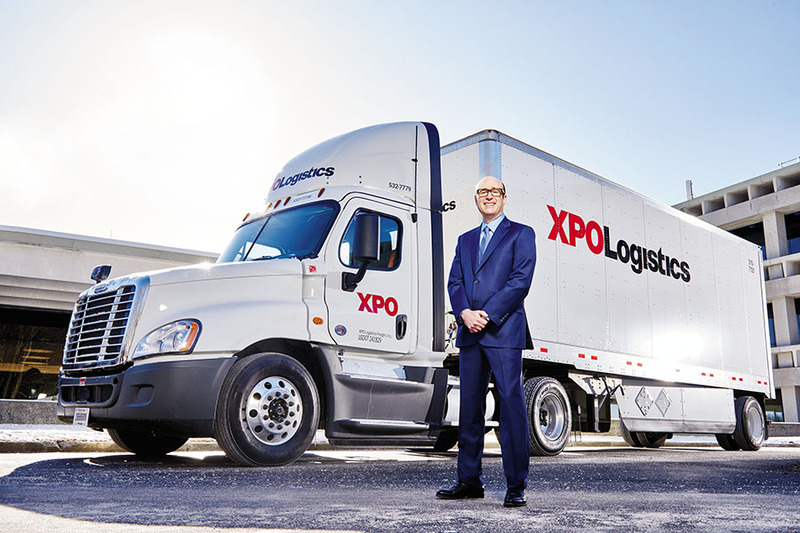 “XPO is going to be a global logistics juggernaut,” says Stephen DeNichilo, a portfolio manager at the $6 billion Federated Kaufmann Fund, which holds XPO shares. He calls the stock undervalued relative to peers JB Hunt, CH Robinson and Old Dominion Freight Line.